When you’ve identified a problem, the first step is to acknowledge that someone else has probably confronted the same issue and a solution might already exist. However, efforts to find out whether someone else has already found a solution are often given only cursory thought or investigation. This results in many innovation teams ‘reinventing the wheel’ – spending time and money on developing solutions to problems that have already been solved by other people. In a sector where resources are often overstretched, a responsible and ethical approach to innovation means you should first search for existing solutions. The starting point for your search is the design criteria developed as part of your Challenge Brief. You will need to assess whether your design criteria contain enough information to carry out search activities. If you are struggling, you may need to revisit the design criteria exercise and consider further criteria to help to guide your search. Tip: technical specifications will be most helpful in focusing your search activities. 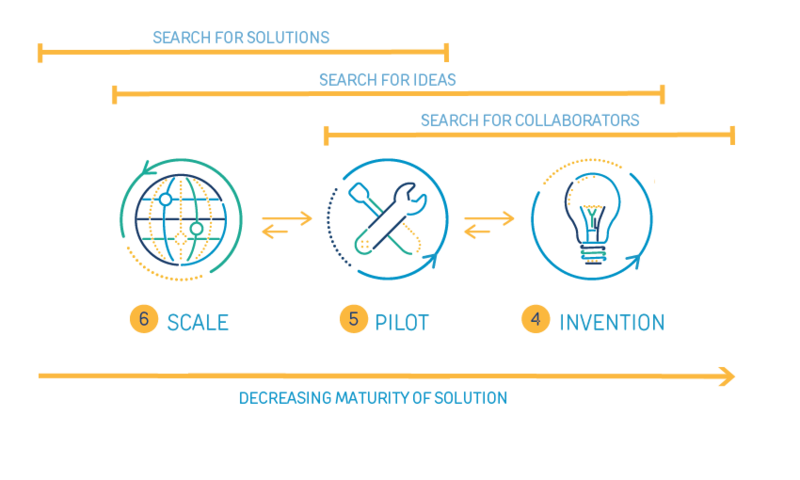 To help you navigate the Search stage, the three modules in this section will encourage you to think through the innovation journey backwards. Your first step is to search for proven solutions that match your design criteria. If you can’t find a proven solution, you should search for ideas. If there are no ideas that appear to meet your design criteria, you should seek out potential collaborators with the skills and experience to develop a solution. In this way, you start by looking for the most mature solutions before working backwards to more nascent ideas and potential partners. Across and within each of these modules, there will still be plenty of overlap and differing levels of solution maturity. Within the Search for Ideas modules, for example, you might uncover anything from a working prototype to an idea written up in a document. When searching for solutions, ideas or collaborators, you should continue to be mindful of the problem and nature of humanitarian context. The same ethical rigour and due diligence that would be applied to the invention of a new solution needs to be applied to your shortlisting and choice of solutions, ideas and collaborators. What are the factors regarding the type of disaster and its drivers that you need to consider when shortlisting potential solutions, ideas and collaborators? Does your problem occur in a particular stage of the disaster management cycle, and does that have any implications? How might you engage local communities or other partners and involve them in decision making? Are there any other humanitarian organisations, clusters or local authorities that you might need to engage? Find solutions that are already being used to address the problem you have identified. They need to have been tested and used in real-world environments, showing positive impact in addressing a directly comparable problem. If you cannot find an existing solution that closely meets your design criteria, the activities in this module will help you uncover ideas that could form part of a solution. If you cannot find solutions that closely meet you design criteria, and you’re struggling in your search for ideas, the activities in this module will help you identify potential collaborators.